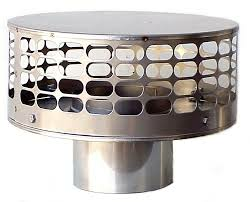 We carry a complete line of round chimney caps designed for masonry round flue tiles, single wall rigid pipe, chimney flex liner, double or triple wall prefab chimney pipe and plumbing vent pipes. Copper and custom sizes are available in some models. All made in the USA. Stainless Steel Lifetime Warranty.